Neve Swimwear is finally here. Check out our huge swimwear wardrobe that provides incredible mix and match opportunities thanks to smart pattern and solid color palettes. See the below for a quick glance of some items or the gallery below that for individual posters and details on incredible savings that can be made with our complete collection pack! July 4th VIP Group Gift + Sale Ends Soon! To celebrate July 4th Neve has released a brand new VIP Group gift. Simply head on down to Neve today, join the group and enjoy your gift! Also take a look at our region-wide sale that is still running for a few more days. Happy Independence day! 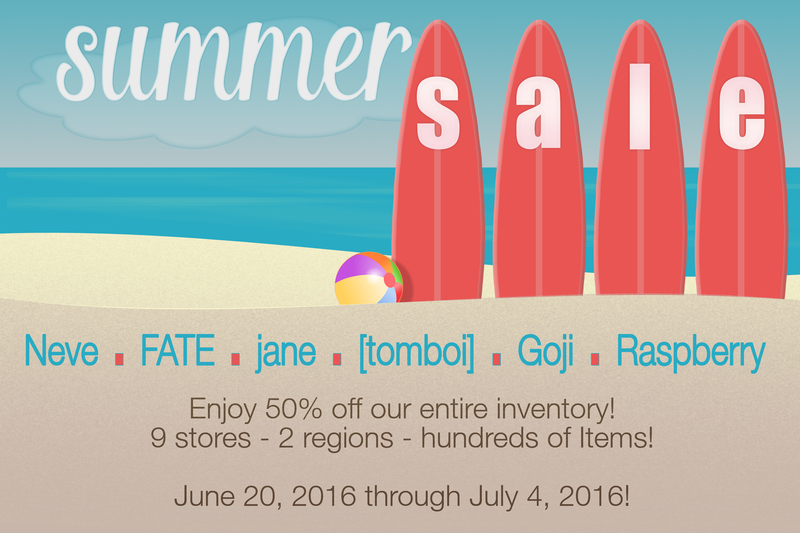 Enjoy discounts on popular brands: Neve, FATE, jane, [tomboi], Goji and Raspberry for a limited time.